Adopted by all countries in September 2015, the Sustainable Development Goals (SDGs) call on us all to eradicate poverty, ensure that all children reach their full potential, support peaceful and healthy communities, and conserve nature. The vast majority of people around the world support these goals, but many do not know about them or have difficulty relating to them. The artists who bring you Concert for a Sustainable Planet hope to address this gap, by fostering a dialogue and inspiring us to action. This concert will inspire hope, dedication, and commitment among groups of people worldwide to build a better planet together and foster positive change in society. The concert will build active connections between the performers on stage and the audience, and will be recorded for on-demand viewing for those who are unable to attend in person. The concert is presented by the United Nations Sustainable Development Solutions Network (SDSN) and the International Institute of Applied Systems Analysis (IIASA). Our special guest cellist will perform selected works (solos). Symphony No. 3 represents a major milestone in the history of music and is one of Beethoven’s most celebrated works. It is one of the pieces written in Beethoven’s middle period, which was characterized by greater freedom of expression and creativity. This piece, Antonius from Padua Preaching to the Fish in English, tells the amusing tale of St. Anthony, who, when faced with a church empty of parishioners, decides to preach to the fish in the river, contributing simultaneously to life below water (SDG 14) and quality education (SDG 4). A question choreographed by Gloria Benedikt and Mimmo Miccolis, in relation to the 17 Sustainable Development Goals. The Musical Postcard Project connects young musicians and composers across large distances, to collaboratively express their dreams and vision about the world of 2030 through music. A network of music professionals in New York and Amsterdam work with music schools and refugee camps around the world, and especially in communities affected by conflict, climate change, migration, and poverty. Young, local musicians speak up and share their most personal statements through a short music video. These “Musical Postcards” travel to school classes in other countries where teenagers compose a response based on the original song or melody. These compositions are performed by virtuoso professional musicians, bringing the perspectives of the new generation to a broader concert audience. Recordings of the performance are sent back to the young composers, empowering them to develop their personal expression of a vision for the future. More information on http://musicalpostcards.org. Shapira’s musical narration of the SDGs serves as a light-hearted appetizer to the second half of the concert. The second part of The Five Continents concerto will also include narration of philosophical and scientific texts edited by Israeli-Iraqi poet Roni Somek. Composer Viktor Ullmann, born in 1898, briefly served in the military during WWI before studying music with Arnold Schönberg in Vienna and Alexander von Zemlinsky in Prague. Of Jewish descent, Ullmann was deported to Theresienstadtby the Nazis in 1942, sent on to Auschwitz in 1944, and killed. The words of this humorous song were written by Iran’s greatest poet, Hafis, at Shiraz during the 12th century. First translated into French, and then into German, they met Ullman and this composition while he was in Prague. The song demonstrates the universality of art and is a vehicle to explore the themes of SDGs 5 (gender equality) and 10 (social inclusion). Can artists support transformations to sustainability? Both science and art have a transformative power, as they are able to depict the world as it is and to imagine it as it could be. Yet, while scientists have significantly shaped the Sustainable Development Goals (SDGs) through providing conceptual work and evidence, artists’ input in shaping the SDG discourse has been limited. 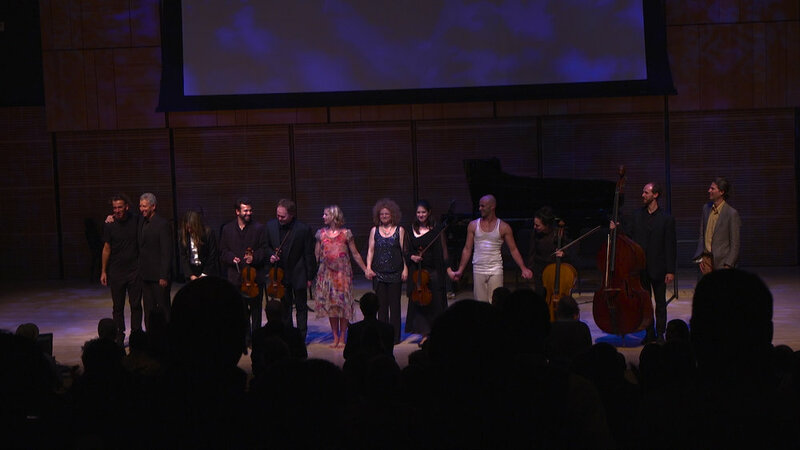 Concert for a Sustainable Planet embodies an effort to strive for a new balance. Could artists support the implementation process of the SDG agenda and thus transformations to sustainability? And if so, how? The science and arts activities at the International Institute for Applied Systems Analysis (IIASA) explore how, through a true collaboration between these two spaces, innovative answers can be found for a sustainable transformation of our societies. Through the interaction of science and arts, we seek to explore new solutions to the challenges facing humankind. Customarily, a comparatively small segment of society enjoys traditional Western “high art.” High art has become a comfortable and pleasant pastime that provides opportunities to reflect on life, evoking familiar emotions and engaging and inspiring audiences in playful intellectual exercises. It has its value, and occupies a stable place in society. But what about the scary and the unknown? Today, a growing number of artists are challenging art forms and moving away from traditional spaces and audiences to better engage with complex global challenges. As engaged citizens, they are eager to take on the burning question of our time: How might we, as a global community, make a transformation to a sustainable lifestyle? This has led to what we have come to define as constructive art. Constructive art doesn’t just illustrate a topic, reflect on a problem or, in the case of activist art, advocate for a particular point of view. It poses original questions that open up avenues for inquiry and aims to change perceptions, breaking negative patterns of behavior and promoting new ways of relating to humans and nonhumans. Two performances in tonight’s program will showcase how interaction between scientists and artists can foster systemic thinking and, more importantly, systemic action. Four Drifting Seasons provides an intimate and affective experience of abstract climate change data through music. This conveys the urgency of global warming without resorting to simplification or ‘crying wolf.’ Contextual Matters translates the complexity of SDG implementation into physical movement with the goal to visualize the human effort required for the SDG agenda to succeed. Meanwhile, a third piece, Musical Postcard, demonstrates how public engagement can be facilitated through this collaboration. Constructive art engages with real-life problems through the artistic process. It breaks the old dichotomy between autonomous and applied art to make room for a novel approach where artists create autonomous spaces within the context of current global challenges. Constructive art tends to be disruptive and unconventional, but it is always strongly connected to contemporary society and concerned with making a positive change. While the methodologies used in constructive art vary, we can identify two main approaches: First, art that engages with science to contribute to the discourse on global challenges and envision practical solutions. Second, art that engages with communities, experts, or other professionals to derive new insights about societal issues. Within these two approaches there are five hallmarks that define constructive art: social relevance, investigation, process, constructive output, and media engagement. There is strong evidence that out of the brain’s two processing systems — the experiential processing system, which controls survival behavior and is the source of emotions and instincts, and the analytical processing system, which controls analysis of scientific information — it is the experiential processing system that is the stronger motivator for action. To successfully address complex global challenges, we also need to align our beliefs and values with the reality of our changing world. This deep, often challenging, internal work must be supported through individual and collective processes that embrace subjectivity, while being accountable to scientific facts. Constructive art is uniquely positioned to do that and thus to support sustainability transformations. To learn more, visit www.iiasa.ac.at/arts. Together with Jan Driessen and Killian Elbers, activist composer Merlijn Twaalfhoven translated climate change data from the Northern hemisphere into music. The composition is true to the data, and the vocals are a direct reflection of the changes in our climate since the beginning of measurement in 1880 until spring 2017. A well-known graph is thus transposed from a visual to an auditory experience, ending intensely with one highly pitched tone. In this way, we can relate freshly to the story the data is telling us, surpassing the overly politicized and polarized tone which surrounds this topic. In Four Drifting Seasons, each vocal group represents a season, with low voices singing the winter, middle voices the spring and autumn, and soprano voices the summer. The occurrence of extreme weather events like floods and storms are expressed through articulation, dynamics, and percussive sounds. Since the music is neither melodic nor conventional, it is difficult to perform. To ensure accuracy the team developed an app to support singers in finding the exact pitch during the performance. Instructions, examples and a manual can be found on the website www.twaalfhoven.net. How are countries and the world community navigating potential trade-offs and collaborating to harness synergies? How can we ensure that progress in one area does not constrain progress in another? Concluding the concert, this new dance-science piece will be an artistic translation on the integration of all dimensions of sustainability. Inspired by problems, drivers, and impacts that arise from achieving the SDGs, it explores the question whether we have what it takes to achieve sustainability. The piece is developed and choreographed by Gloria Benedikt, Dancer, Choreographer, and Associate for Science and Art at the International Institute for Applied Systems Analysis (IIASA) in collaboration with Italian dancer and choreographer Mimmo Miccolis, Dutch composer Merlijn Twaalfhoven, and IIASA scientists Brian Fath, Frank Sperling, and Marcus Thomson.